Zeno, an African grey parrot abruptly orphaned in the middle of Brooklyn, knows he is a beautiful, brilliant bird, but that knowledge won’t help him survive in the concrete wilderness. Alya, a girl with leukemia, is caught between surviving and not trying anymore. If they ever find each other, they may re-find the hope that comes with newfound friendship. The light colour-schemed illustration style makes this cover seem much more idyllic than the actual story, but it nonetheless fits for an MG anthropomorphic novel. The expanse of sky framing the lovely brownstone buildings has a beautiful texture to it. However, the title doesn’t have enough space to do its elaborateness justice. 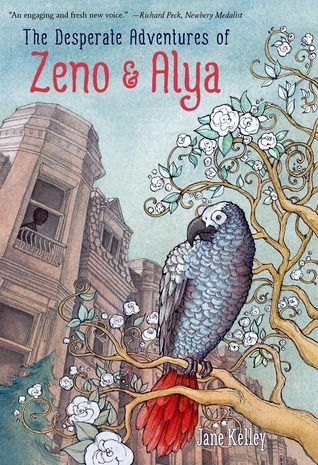 A short, sweet novel, The Desperate Adventures of Zeno and Alya is unconventional, and mostly successful in its efforts. Zeno’s narration is wonderfully idiosyncratic and completely credible; his voice creates a personality for an African grey parrot that you can fully imagine. Alya’s internal narration is also believable for a young, sick girl, a girl who has been sick for a long time. Jane Kelley occasionally jumps out of her protagonists’ head to a side character, puzzlingly, but it happens rarely enough that one may disregard it. The plot is nothing special. It’s a good thing this is a short book; otherwise the repetitive action of Zeno getting sidetracked on his way to Alya’s window would get too boring. This isn’t helped by the rather heavy-handed messages and lessons Zeno learns in regards to friendship and life in general. Nevertheless, when he hits his lowest low, the reader’s empathy will likely be stirred. Things pick up at the end as heartstring-tugging interactions between Zeno and Alya fill emotionally-fraught scenes. Alya’s family (particularly her brother Parker) are remarkably well-developed considering their scant pagetime, and they make the closing sequences more touching. And the final scene, the interaction between Alya and Zeno is a poignant tying-together of all the themes introduced throughout the story. From Zeno removing her cap to the idea of escapes to the naming of his friend… not ashamed to say I teared up a little. Ethnic balance: N/A. One family and a bunch of birds.